Systec's telescopic conveyor (TEL) is ideal at a manual feed station on a flexographic converting machine infeed. The adjustability of the TEL allows end positioning for the conveyor that is convenient for the operator in proximity to the feed table. This is a no maintenance device applying the most advanced safety designs and features. 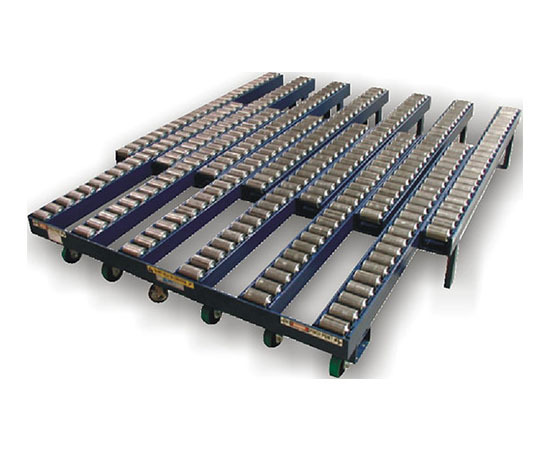 Floor anchored, stationary conveyor sections with movable fingers mounted on multiple poly casters for smooth and easy movement of the conveyor section. Mobile section is equipped with a floor lock for securing the sections once in place. Can be provided with v- groove steel wheels and angle rails if uneven floor surfaces are a problem.